The Buckingham Oak Stool Cream Leather is an opulent model with sumptuous style that delivers true sophistication to your home. With an exclusive allure and traditional charm, the Buckingham Bar Stool is a luxurious choice for your kitchen or bar area. Upholstered in chic cream bonded real leather, the seat is sprung and belted for comfort and is edged with chrome studs for a majestic finish. Regal and refined, the backrest boasts a classic scroll top design, and includes lavish button detailing for a fashionable focal point. The fixed height frame is formed of solid wood and displays a natural oak finish that adds a pastoral charm. Strengthening the design, bracing bars connect the legs and act as a practical footrest. This design is complete with protective floor pads. 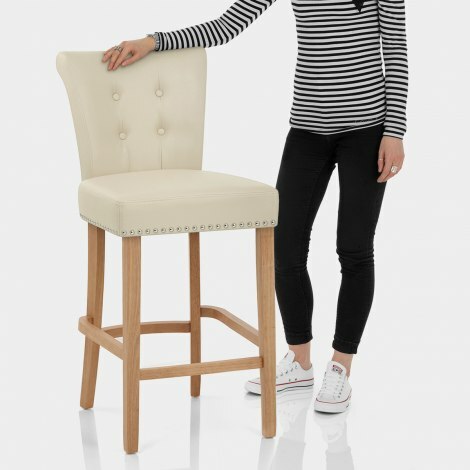 "These stools are excellent quality and look stylish"
I read reviews before making my purchase, and I am happy to write that I received a fantastic service, just like the reviews I had read! My order was easy to place, and pay for. The delivery was exactly what I was told at time of purchase, and my goods, kitchen bar stools are great quality and good looking. Would highly recommend Atlantic Shopping! These bar stools are lovely - very solid and excellent quality. The seats are lovely and big so you feel very secure. Great product for a good price. Was nervous ordering online without seeing the chairs first hand. However, I'm delighted. The delivery was fast and professional. And the chairs look great and are of great quality. I had been eyeing up other chairs in TKMaxx but these ones are cheaper and much better quality.